Found this plant at Grootscholten. This member of the Euphorbiaceae family was described by Nicholas Edward Brown in 1911. It is found in the south and south-west of Madagascar, growing in well drained soil with some water and not too much sun. 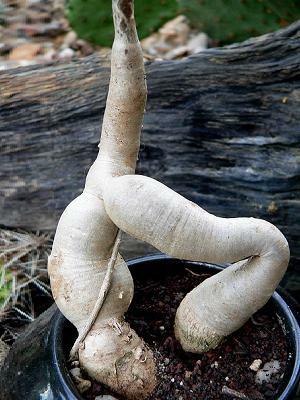 The caudex will grow to 20 centimetres in diameter, the stems to 2 meters in height. 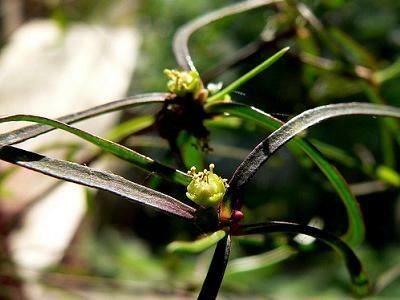 The flowers are yellow to pale red, and besides seeds, it can be reproduced by cuttings of the stems and roots. 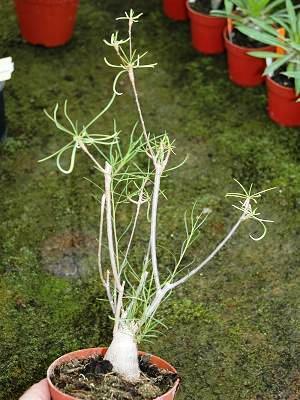 Seedlings many times produce knots (like in a rope) in their caudex. Young plant made by tissue culture and its swollen root.